I could tell by the high-pitched squealing noise that the water pump on my 1976 Corvette was at death's door. This water pump was a chromed unit to add some eye candy to the engine compartment and, although it looked spiffy, it didn't have a very long life. Since I hadn't had much luck with chromed mechanical components in the past, I opted to go with a standard water pump as a replacement unit instead of another chromed one. While the project car here is a Corvette, the prep and installation is virtually the same for any small-block carbureted Chevy. Here's what's involved in getting it ready for installation. 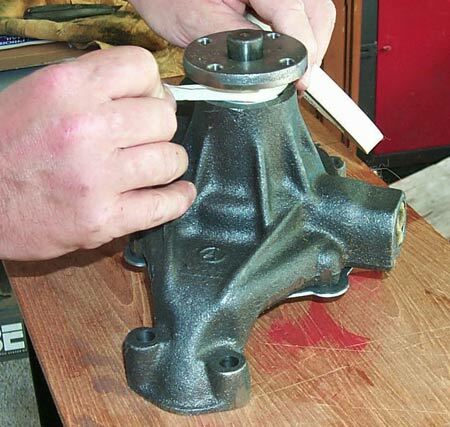 The first task is to prep and paint the new water pump. Use masking tape to mask off the shaft seal and bearing, since you don't want to get paint on these parts. 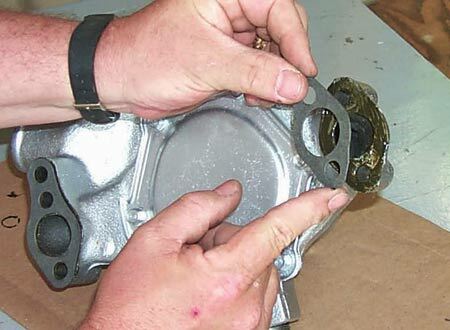 Next, block off all the openings in the water pump. Paper towels or an old shop rag does the trick nicely. Normally, the water pump would be painted with "Chevy Orange" engine paint available from the local auto parts store. However, since many of my engine components were silver powder-coated or chromed, I opted for silver paint. 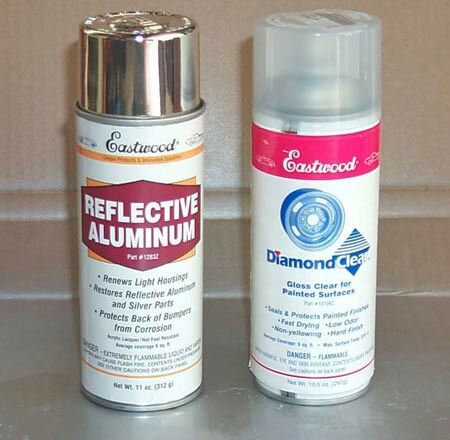 Eastwood's Reflective Aluminum is the best silver paint I've come across. 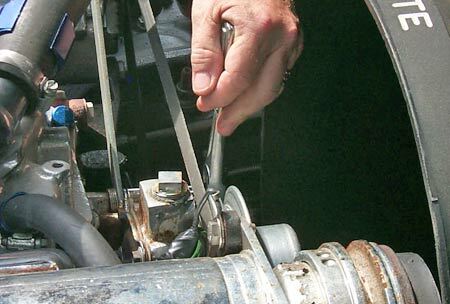 The mounting flanges of the water pump must also be masked with tape. Since these flanges will be mating with the gaskets, a bare metal surface is the best insurance for a leak-free installation. After painting, a generous coat of Eastwood's Diamond Clear for Painted Surfaces was applied for added durability. 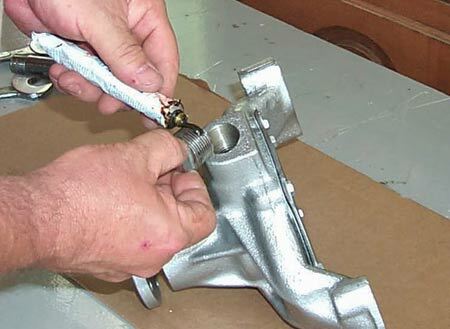 Be sure to let the paint on the water pump dry thoroughly before proceeding with the installation. Open the petcock on the bottom of the radiator to drain all of the engine coolant. Use a clean container to catch the liquid so it can be reused later. 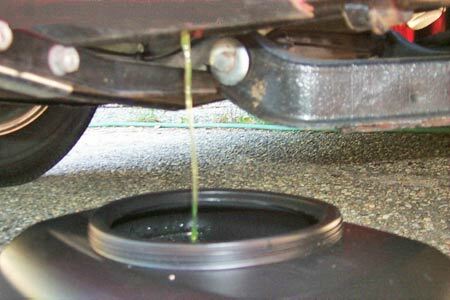 Be particularly careful not to let any antifreeze drip onto your garage floor or driveway if you have pets; it is sweet tasting and highly toxic to animals if ingested. Four bolts are use to secure the fan to the water pump. Remove these bolts and lift the fan off the shaft, being careful not to hit the radiator fins while extracting it from the shroud. 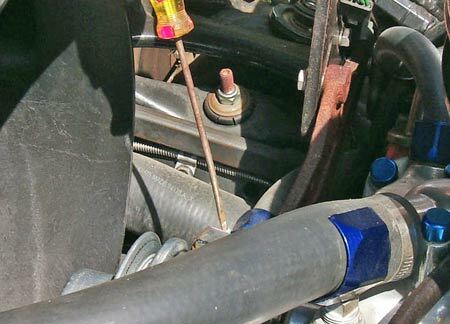 A long-bladed screwdriver is used to loosen the hose clamps on the inlet and outlet hoses connected to the water pump so they can be disengaged from the pump. 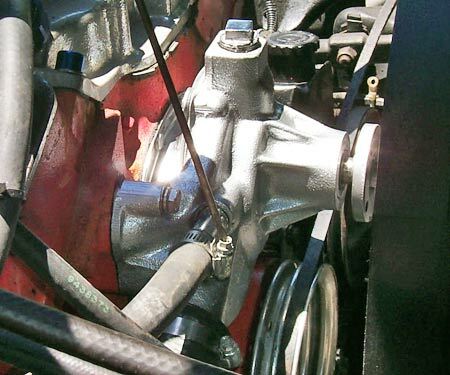 Four bolts are used to secure the water pump to the engine block; one of these bolts also secures the alternator bracket, and this bolt should be removed first so the alternator can be moved for easy belt removal from the pulley. 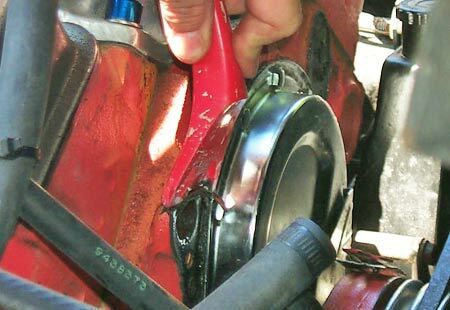 Once the belt is slipped off, the pulley can be removed from the water pump shaft as well. 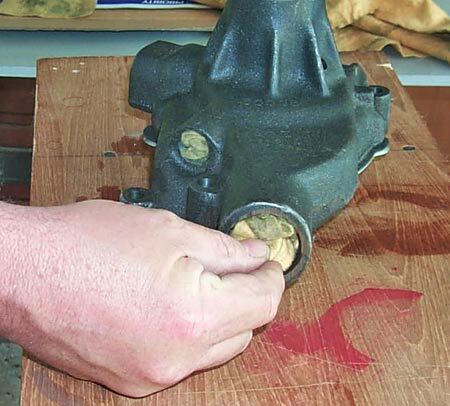 Use a razor blade or a utility knife blade to remove any gasket debris still attached to the block after removing the old water pump. 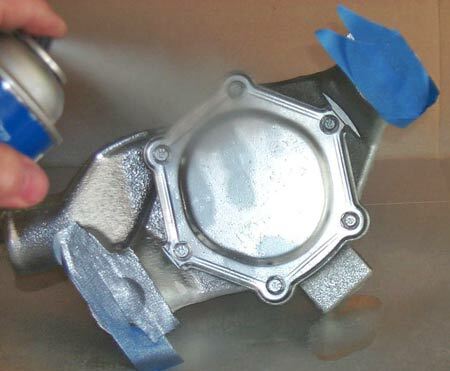 Failure to make this surface scrupulously clean will result in leakage of coolant. A thin bead of Permatex gasket sealant on the threads of the plug will ensure a good, leak-free seal. I opted to recycle the chrome-plated plug from the old pump rather than using the bare-metal plug that came with the new pump. 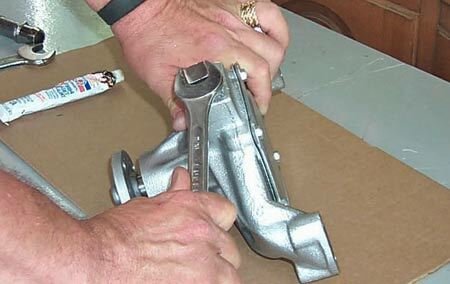 A 3/4" wrench is used to tighten the plug. Permatex is also used on the threads of the hose fitting. Again, I recycled the chrome-plated fitting from the old pump. 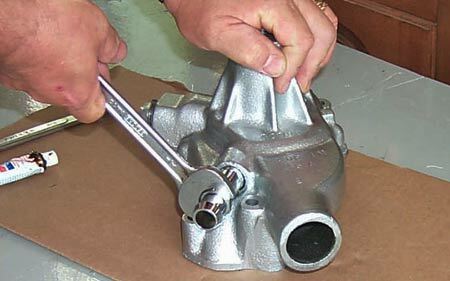 A 5/8" wrench secures the hose fitting to the pump. 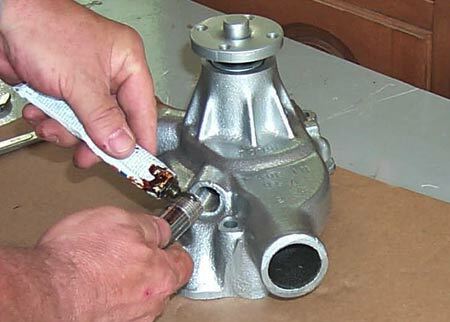 The gaskets supplied with the pump are identical, but the flange on the passenger side of the pump is shorter than the one on the driver side. 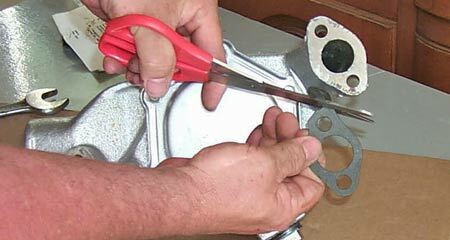 Use a scissor to trim off the excess gasket material for a neater installation. Coat both of the pump flanges with some Permatex and press the gaskets in place. 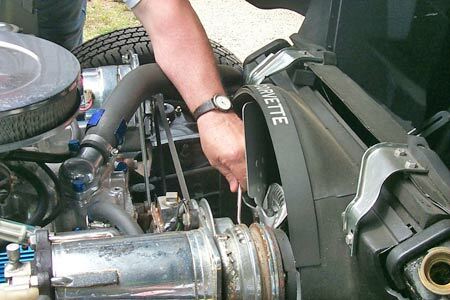 After bolting the new pump on, reattach and tighten the inlet and outlet hoses, remount the pulley and fan, tension the alternator belt and tighten and refill the radiator with the coolant previously drained from it. That's all there is to it!